I have had so much work and studying to do this weekend I was worried my brain would spontaneously combust, so I deemed some downtime every now and then would be appropriate. 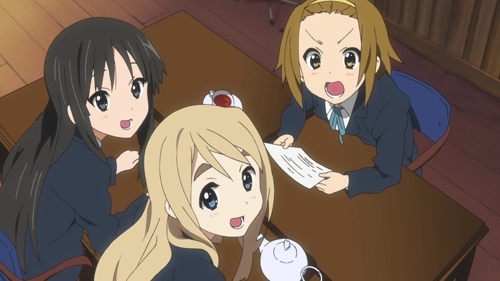 Given I was four episodes into K-On when my first anime blog was wiped and because it's such a light-hearted (get it?) show I thought I may as well start watching it again from the beginning to maintain my sanity. It worked surprisingly well in this capacity! 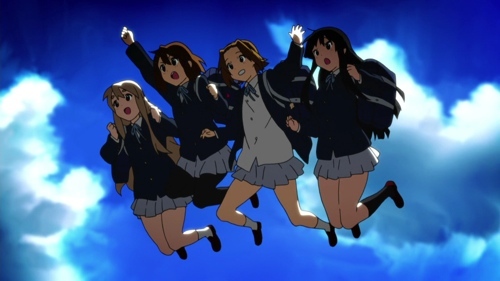 If you've been living under a rock, K-On! is the story of four girls who try to rescue their high school's light music club from being cancelled. I admit it seemed like an overly simple premise to me initially, but when I started watching it was such a pleasantly fun distraction that also didn't take itself too seriously I was hooked. We start with Hirasawa Yui who's energetic, incredibly clumsy and allegedly can't read analogue clocks early in the morning, though she is capable of the infamous eating toast while running routine! She does make it to school in time and is accosted by clubs asking for her membership in much the same way people used to ask me to join ECAs in high school, but just like I was she has no friggen idea what she wanted to do. 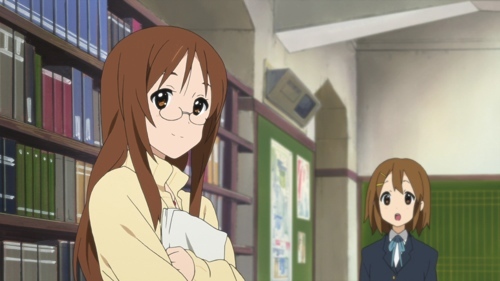 Meanwhile we're introduced to Tainaka Ritsu and Akiyama Mio who is anxious to join the light music club and who was forced to give up plans to join the literary club respectively. Apparently they go back quite far, even to an earlier time when they attended a live rock concert and knew that's what they wanted to to! Well okay as Mio pointed out they only watched it on television, but the point stands! Cue a frustrated Mio headshot. 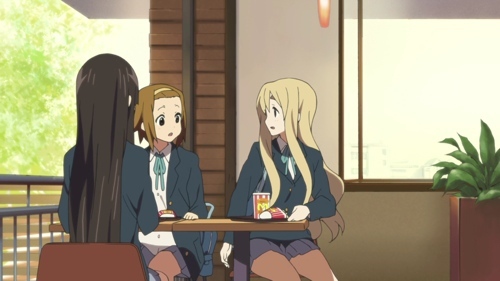 The entire plot for the series is realised when Ritsu and Mio attempt to join the light music club only to be told by the sensei that it's going to be cancelled due to a lack of members; turns out you need four people and they've only got two. That scene where Yui drops all the papers and Ritus and Mio roll their eyes was so awkward but so well done! While waiting in the clubroom for new recruits we're introduced to Kotobuki Tsumugi, the soft spoken, well to do wealthy Mikuru character who says she can play keyboards. They're thrilled and take her to a fast food restaurant where she admits to looking forward to being asked "whether she wants fries with that" because she'd never had fast food before. Cue a surprised shot of Ritsu and Mio! At this stage the story is largely about Yui deciding to join the light music club after realising how good she is at the castanets ^_^. 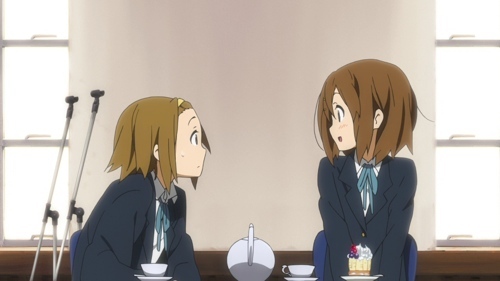 Initially she's too shy but eventually she bumps into Ritsu and joins the other three in the club room where she eats far too much cake and tea while the others grill her on her favourite guitar players. Just a minor inconvenience that she can't play guitar of course! 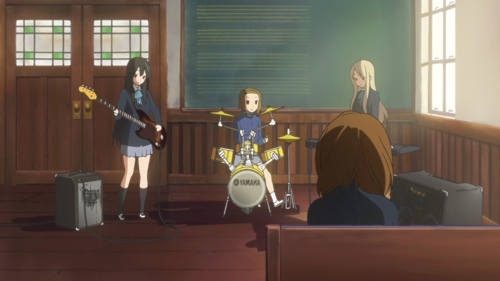 She's convinced to stay when finally she's given an impromptu performance with Ritsu on drums, Mio on bass and Tsumugi on keyboards. Yui is brutally honest in her awesome way, but I gotta say if the bands we had in our high school were half as good as their supposed lacklustre one, I would have paid attention! I can't quite put my finger on why, but I love the graphics in this series, they're in keeping with the show's overall whimsical nature. The designs of the characters' faces are simple but are able to show a surprising array of emotion… and cuteness. Sorry, it had to be said! There are also an above average amount of awesome frames; I know people who upload hundreds of screenshots for their reviews but as usual I try to restrain myself to no more than half a dozen. It's easy when the show is dull or repetitive, it's harder for a show like this! As I also talked about previously, I think much of the criticism levelled against K-On and shows like it is people start watching it with unrealistic expectations and get frustrated when said expectations aren't met. Yes it's KyoAni but if you expect the same level of weirdness and awesomeness as from Suzumiya (prior to Endless Eight) you're going to be disappointed, plan and simple folks!